Played amateur baseball at the Puerto Rico Baseball Academy in Gurabo, P.R., and was named a Rawlings First Team All-American in 2012, his final year at the academy...Drafted by Houston with the first overall selection in the 2012 MLB Draft...signed by Astros scouts Larry Pardo and Joey Sola...Became the highest-drafted player selected out of Puerto Rico all-time, a label that was previously held by catcher Ramon Castro, who was picked 17th overall by Houston in 1994...In 2017, became the first shortstop in Astros history to start an All-Star Game...In 2015, became the second player in franchise history to win the Jackie Robinson Rookie of the Year Award, joining Jeff Bagwell (1991, NL)...he also became the sixth Puerto Rican to win the Rookie of the Year, joining Orlando Cepeda (1958), Benito Santiago (1987), Sandy Alomar (1990), Carlos Beltrán (1999), Geovany Soto (2008)...In 2015, also received Sporting News AL Rookie of the Year honors and the MLBPA Players' Choice Award for Most Outstanding AL Rookie...His 471 games played at shortstop are the secondmost by a shortstop listed as 6'4" or taller in Major League history...Cal Ripken Jr. (6'4") holds the top spot at 3,001 games...Was added to the Astros 40-man roster in June of 2015...is currently signed to a one-year contract for the 2019 season...is under Astros club control through 2021. Played in 110 games in a season hampered by a 36-game stint on the Disabled List from June 26-Aug. 10 (lower back soreness) ...became the first shortstop in MLB history to reach 20 doubles and 15 home runs in each of his first four Major League seasons...led the Majors with 11 sac flies, tied for the fifth-most in a single season in club history and the most since Josh Reddick's 12 in 2017...took a big leap forward on the defensive side of his game, posting career-best marks in fielding percentage (.984), defensive WAR (1.5) and zone rating (.836)... ranked fourth among MLB shortstops in fielding (.984)...was the third-best fielding percentage by a shortstop in a single season in club history, behind only Adam Everett's 2006 season (.990) and Roger Metzger's 1976 season (.986)...hit .282 (57x202) with 12 doubles, one triple, eight homers and an .818 OPS (.348 OBP/.470 SLG) in 52 road games...made his third-career appearance on the Astros Opening Day roster and started at shortstop on Opening Day for the third consecutive season...left the game on June 6 vs. SEA with right side discomfort...missed the next four games but did not serve a DL stint...placed on the 10-day Disabled List on June 29 (retroactive to June 26) with lower back soreness...activated from the DL on Aug. 10...went 1x3 with an RBI on Opening Day on March 29 at TEX...was his third consecutive Opening Day game with an RBI...became the second shortstop in MLB history to record an RBI in three separate Opening Day games prior to turning 24 years old, joining Alex Rodriguez (1995-97)...posted his seventh-career four-hit game on March 31 at TEX... hit his first-career inside the park home run on April 3 vs. BAL...was the 40th inside the park homer in franchise history, and the fourth hit by an Astro at Minute Maid Park (last, Jonathan Singleton on Aug. 2, 2014 vs. TOR)... recorded his seventh-career multi-homer game on April 20 at CWS...joined Alex Rodriguez (10) as the only shortstops in MLB history to post seven multi-homer games before turning 24 years old...his seven multihomer games also marked the most in franchise history by a player prior to turning 24, regardless of position... hit a 446-foot solo homer on May 3 vs. NYY, the longest homer hit by an Astros player at Minute Maid Park in 2018...hit his 72nd career homer on May 12 vs. TEX in what was his 400th career Major League game...only three shortstops in MLB history recorded more homers within their first 400 games in the Majors: Ernie Banks (87), Nomar Garciaparra (86) and Alex Rodriguez (82)...recorded a 70-game errorless streak from Sept. 21, 2017- June 6, 2018, a franchise record streak by a shortstop...surpassed the previous club record of 59 games set by Roger Metzger in 1976...hit a walkoff RBI single in the 12th inning on June 23 vs. KC...was his seventh-career walkoff plate appearance and sixth-career walkoff hit...six walkoffs from 2015-18 tied for the most in the AL with Khris Davis and Ian Kinsler...combined to hit back-to-back home runs with George Springer in Game 1 of the doubleheader at BAL on Sept. 29...posted a .371 on-base percentage in eight starts at shortstop in the postseason...hit a three-run homer off Brad Hand in Game 3 of the ALDS at CLE, tying Albert Pujols and Mickey Mantle for the most postseason home runs by a player prior to turning 25 years old in MLB history...moved into second-place on MLB's all-time postseason homers list by a shortstop (8), trailing only Derek Jeter (20)...in the ALCS, hit .316 (6x19) with one double, three RBI and a .409 OBP...hit a go-ahead RBI-single off Joe Kelly in Game 1 of the ALCS at BOS...played in five games on a rehab assignment with Double A Corpus Christi, going 3x16 with one double, one homer and two RBI...started four games at shortstop and one game at designated hitter. The American League's starting shortstop in the 2017 All-Star Game had an excellent third season in the Majors despite being sidelined for 42 games with a torn ligament in his left thumb that required surgery...set a franchise record for home runs by a shortstop with 24, besting the previous club record of 22 he set during his 2015 rookie season...became the first shortstop in Major League history to reach the 20-homer mark in each of his first three seasons...set career highs in batting average, on-base percentage (.391), slugging percentage (.550) and OPS (.941)...led all American League shortstops in batting average, on-base percentage, slugging percentage and OPS...posted the highest OPS by a Major League shortstop since Hanley Ramirez (.954) in 2009...became the first shortstop in club history to start the All-Star Game...became the sixth-youngest shortstop in MLB history to start the All-Star Game, and the youngest since Alex Rodriguez in 1997...has 66 homers through his first three Major League seasons...that ranks second all-time by a shortstop, behind only Nomar Garciaparra (69 from 1996-98)... his .366 career on-base percentage is the highest by an AL shorstop through his first three seasons since Derek Jeter posted a .368 mark from 1995-97...was one of the top hitters in the Majors against left-handed pitching... hit .391 (36x92) against lefties, which ranked fourth in MLB (min. 100PA)...his 1.066 OPS vs. lefties ranked second in the AL (min. 100PA) behind Justin Upton (1.155)...became the first AL shortstop since Alex Rodriguez in 2007 (30HR) to hit 20 homers before the All-Star Break...batted .325 (103x317) with 18 doubles, 20 HR and 65 RBI in the first half this season...made his second career Opening Day roster and start this season...was placed on the 10- day DL with a torn ligament in his left thumb on July 18...activated from the DL on Sept. 3...originally aggravated the thumb on July 4 at ATL after sliding into home plate...left that game in the 4th inning and was considered day-to-day...suffered the injury that put him on the DL officially on July 17 vs. SEA...homered on Opening Day on April 3 vs. SEA, hitting a 449-foot homer off RHP Felix Hernandez...became the first Astros player to homer on Opening Day in consecutive seasons since Richard Hidalgo did so from 1999-2000...became the fourth Major Leaguer to homer on Opening Day in each of the last two seasons, joining Bryce Harper (3 straight), Freddy Galvis and Scooter Gennett...hit by a pitch on the hand on April 15 at OAK, missing three games (April 17-19)...doubled in three straight games from April 26-28, tying the longest doubles streak of his career...hit just .233 (20x86) with two homers and eight RBI in 22 games in April...turned his season around in May and was named the AL Player of the Month for May...hit .386 (39x101) with eight doubles, seven homers, 26 RBI and a 1.130 OPS (.368 OBP/.673 SLG) in 26 games in May...led the AL in batting average and RBI, while ranking third in OBP, fifth in hits and OPS and tied for sixth in slugging...had multiple hits in 14 of his 26 games...his seven homers marked his most in any month in his career...was his first-career Player of the Month award...on May 3 vs. TEX, went 4x5 with a homer and a double...tied his single-game career high for hits, falling a triple shy of the cycle...drove in the game-winning run in the 10th inning on May 6 at LAA...was his seventh-career game-winning RBI in extra innings...teamed up with Carlos Beltrán with back-to-back homers on May 9 vs. ATL...per Elias, it marked the first time in Astros history that a player aged 22 or younger and another player over the age of 40 both homered in the same game...the last pair of any teammates to do this was on Sept. 15, 2015, when Greg Bird and Alex Rodriguez did so for the Yankees... recorded an RBI in a career-long, six consecutive games from May 9-14...recorded five straight multi-hit games from May 25-29...marked a career-long streak, and tied him for the second-longest streak by an Astros shortstop in club history (most recently accomplished by Marwin Gonzalez in 2012)...per Elias, became the second player in club history to record 300 hits and 50 homers within his first 300 Major League games, joining Lance Berkman... posted another six-game RBI streak, this time from May 29-June 4...posted a 10-game hitting streak within that span from May 25-June 4...recorded his fourth-career multi-homer game on May 29 vs. OAK...had a career-long 15-game hitting streak from June 20-July 7...was hte longest streak by an Astro since Hunter Pence had a 23- game streak in 2011...ended the first half of play with a 4x5, two-homer game on July 9 at TOR...was his fifth career multi-homer game...was second in the AL in WAR (4.9) and fourth in OPS (.979) in the first half...posted a career-long, 27-game on-base streak from June 10-July 15...was the second-longest on-base streak by an Astros shortstop in club history behind a 29-game run set by Dickie Thon in 1983...played in six injury rehab games in the minor leagues (Aug 24-Sept. 1), batting .292 (7x24) with one double and five RBI...played in four games at Triple A Fresno and two games at Double A Corpus Christi...hit .133 (4x30) over first seven games back from DL from Sept. 3-9...hit .373 (25x67) with seven doubles, four homers, 16 RBI and a 1.097 OPS over his final 18 games of the year...named the AL Player of the Week for the week of Sept. 25-Oct. 1...was his third career weekly award... hit .520 (13x25) with four doubles, three homers, 10 RBI, eight runs scored and a 1.611 OPS (.571 OBP/1.040 SLG) in six games...led the AL in batting average, hits, runs and RBI during the week, while ranking second in OPS, tied for second in doubles and tied for third in home runs...from Sept. 26-28, became the first player in Astros history to record three straight games with at least three hits and three RBI, per the Elias Sports Bureau...also also became the fifth Major League shortstop since 1913 to record at least three hits and three RBI in three consecutive games, joining Hanley Ramirez (2010), Cal Ripken Jr. (1995), Al Dark (1956) and Glenn Wright (1928)...went 3x5 with two doubles and three RBI on Sept. 26 at TEX...then went 4x5 with two homers, one double and four RBI on Sept. 27 at TEX, his second-career game with four hits and four RBI...then went 4x4 with a double, a homer and three RBI on Sept. 28 at BOS...hit .288 (21x73) with five doubles, five homers, 14 RBI and an .886 OPS in 18 postseason starts at shortstop...tied the franchise record for RBI in a single postseason with Jose Altuve (2017), Carlos Beltrán (2004) and Lance Berkman (2005)...became the first player in MLB history to hit seven career postseason homers prior to turning 24 years old...tied Rich Aurilia (2002) for the Major League record for extra-base hits (10) in a single postseason by a shortstop...homered in consecutive games in the ALDS, going 2x4 with four RBI in Game 2 and 1x5 with two RBI in Game 3...homered and hit a walkoff RBI-double off LHP Aroldis Chapman in the 9th inning of Game 2 of the ALCS vs. NYY...became the fourth-youngest player ever to hit a homer in an ALCS game, behind Derek Jeter (1996), Francisco Lindor (2016) and Evan Longoria (2008)...combined to hit back-to-back homers with Jose Altuve in the 10th inning of Game 2 of the World Series, marking the first set of back-to-back homers in extra innings in World Series history...at 23 years, 33 days, became the eighth-youngest player in Major League history to have three hits and a homer in a World Series game, and the youngest since Andruw Jones did so in Game 1 of the 1996 World Series for the Braves...became the sixth shortstop in MLB history to have three hits and a homer in a World Series game, joining Alan Trammell (1984), Robin Yount (1982), Bert Campaneris (1973), Phil Linz (1964) and Tommy Thevenow (1926). Had a phenomenal sophomore campaign, in what was his first full season in the Majors...recorded his second consecutive 20+ home run season...finished the season with 41 career homers as a shortstop, which became the most in franchise history at the position...joined Mike Trout as the only players since 2007 to record 96 RBI in a season prior to their age-22 campaign...batted clean-up in 91 games...marked the most by an AL shortstop since Nomar Garciaparra batted fourth in 114 games in 2000...marked the most by an Astros shortstop in franchise history...tallied four walkoff hits, which led the Majors...his four walkoffs came on May 24 vs. BAL (single off Dylan Bundy), June 4 vs. OAK (single off Ryan Madson), June 21 vs. LAA (double off Huston Street) and Aug. 1 vs. TOR (double off Scott Feldman)...tied a franchise record, accomplished three other times in a season: Phil Garner in 1984, Nellie Fox in 1964 and Bob Aspromonte in 1963...Correa also had a walkoff via error on July 11...recorded 75 walks, which were the most walks by a Major League shortstop in a single season since Marco Scutaro walked 90 times in 2009... led AL shortstops in walks (75), doubles (36), RBI (93) and OPS (.804)...ranked second in OBP (.360), third in slugging (.444) and tied for fourth in homers (19)...he and second baseman Jose Altuve each had 96 RBI, becoming the first AL middle infield combo to reach 95 or more RBI in the same season since 1950, when Red Sox SS Bobby Doerr (120) and 2B Vern Stephens (144) turned the trick...93 of his 96 RBI came as a shortstop, which set a single-season club record (previously Miguel Tejada, 86 in 2009)...had 21 RBI vs. the Angels, which ranked tied for third against Los Angeles (AL) in a single season alltime...trailed only Sal Bando (22 in 1969) and Jim Gentile (25 in 1961)...made his first appearance on an Opening Day roster...spent the full season on the active roster...missed three games from June 10-12, after sustaining a sprained left ankle on June 9...missed four games from Sept. 7-10 with inflammation in his left shoulder...made his first Opening Day start on April 5 at NYY...at 21 years, 195 days, became the youngest player in club history to make an Opening Day start since Cesar Cedeno (21.050) in 1972...also became the youngest shortstop in club history to make an Opening Day start...previously Sonny Jackson (21.277) in 1966...went 1x4 with a solo HR, two RBI and two steals on Opening Day...became the youngest Astros player to homer on Opening Day at 21 years, 196 days old...Terry Puhl (21.272) previously held that distinction on April 6, 1978 at CIN...marked his 23rd career HR in what was his 100th career game...23 HR are the most HR by a shortstop through their first 100 in MLB history, surpassing Nomar Garciaparra (16)...set a career high with four hits on April 6 at NYY...hit his second and third homers of the season, which was also his third career multi-HR game...became the youngest visiting player with two HR in a game in New York vs. the Yankees since Manny Ramirez in 1993 (ESPN Stats and Info)...became the first Astros player to hit three HRs in the team's first two games in a season...snapped an 0x15 slump with a bases-loaded walkoff, RBI-single in the 13th inning on May 24 vs. BAL...was his second career walkoff hit...had a 12-game hitting streak vs. the Angels which spanned from June 23, 2015-May 27, 2016... at the time, tied as the longest active streak against LAA, along with Chase Utley...batted .375 (18x48) in that span...hit a three-run, two-out, 13th-inning home run on May 29 at LAA in the pinch to give the Astros their series victory over the Angels...marked his first career pinch-hit plate appearance...recorded a walk in a careerlong five straight games from April 27-May 5...tallied eight walks in that span...recorded his 100th career RBI on June 5 vs. OAK...reached 100 RBI in his career (156g) faster than any other player in franchise history...Hunter Pence held the previous record at 158 games...named the AL Player of the Week on June 27, becoming the youngest player in club history to win a weekly award (21, previously SS Andujar Cedeno, 22 years, Sept. 2-8, 1991)...marked his first career weekly award...during the week, led the AL in doubles (4) and extra-base hits (7), while tying for the AL lead in HR (3) and RBI (9)...hit .333 (8x24) with a 1.282 OPS (.407 OBP/.875 SLG)...homered in both games of a doubleheader on Aug. 11 at MIN, going 4x8 with a double, four runs scored, one walk and four total RBI...became the second Astros player at 21 years old to homer in both games of a doubleheader, joining Rusty Staub, who did so on Sept. 19, 1965 at MON...also homered on Aug. 9, giving him a career-long three consecutive games with a homer...became the fourth shortstop in club history to homer in three straight games: also Jed Lowrie (2012), Andujar Cedeno (1994, 1993) and Craig Reynolds (1981)...was named AL Player of the Week for the week of Aug. 8-14...marked his second weekly award of the season (also 6/20-26), and fifth by an Astros player in 2016...during the week, he hit safely in all seven of his games at a .429 (12x28) clip with six runs, three doubles, three HR, 12 RBI and a 1.324 OPS (.467 OBP/.857 SLG)...had a career-long 13-game hitting streak from Aug. 24-Sept. 11...tied the longest by an Astro in 2016 (Gonzalez, 7/15-8/3). A June call-up, Correa played the entire season as the youngest position player in the Major Leagues, yet hit third for the Astros en route to being named the Jackie Robinson AL Rookie of the Year...also earned the MLBPA Players Choice Award for the AL Most Outstanding Rookie and was named the Sporting News AL Rookie of the Year...the 21-year-old set a franchise rookie record for homers in a season (previously Lance Berkman with 21 in 2000), in addition to hitting the most homers by a shortstop in club history for a single season (previously Dickie Thon with 20 in 1983)...despite being the youngest position player in the Majors and playing in just 99 games, led all Major League shortstops in homers, OPS (.857) and slugging (.512), while ranking fourth in on-base percentage (.345)...led all AL rookies in HR, SLG and OPS, while ranking second in RBI and OBP, and third in batting average (min. 400PA)...among Astros rookies all-time, ranked fourth in OPS and ﬁfth in RBI, which were both the highest totals by an Astros rookie since Hunter Pence in 2007 (.899 OPS/69RBI)...stole 14 bases, going 14-for-18 (77.8%) in attempts...14 steals rank seventh all-time in club history by a rookie, and mark the most by a Houston rookie since Willy Taveras swiped 34 bags in 2005...was named the AL June Rookie of the Month...according to the Elias Sports Bureau, his 18 home runs were the second-most by a shortstop prior to his 21st birthday in MLB history,behind only Alex Rodriguez (26)...is the only shortstop in the last 100 years to record 22 homers within his ﬁrst 100 games in the Major Leagues...the previous record was held by Nomar Garciaparra (16 HR in ﬁrst 100 games)...joined Garciaparra (30HR/22SB) as the only shortstops in Major League history to reach 22 homers and 14 steals in their rookie season...per Baseball Reference, his 4.1 wins above replacement ranked as the second-highest total by a shortstop prior to his age-21 season, trailing only Alex Rodriguez and his 9.4 mark set in 1996, his age-20 season...became one of 19 Major Leaguers all-time to record 22 homers prior to his age-21 season...prior to Correa, the only players to do this since 1990: Bryce Harper, Mike Trout, Giancarlo Stanton, Adrian Beltre, Andruw Jones, Alex Rodriguez and Ken Griﬀey Jr...from the date of his Major League debut (June 8) through the end of the season, led the Astros in homers, RBI, extra-base hits (45), go-ahead RBI (20), game-winning RBI (8) and slugging percentage, while ranking second in hits (108) and tied for second in steals (14)...hit .359 (51x142) with 11 homers and a 1.097 OPS (.435 OBP/.662SLG) with two outs...ranked second in the AL in both batting average and OPS with two outs, trailing Lorenzo Cain (.372) in average and Mike Trout in OPS (1.153)...hit .395 (15x38) with four homers, 19 RBI and a 1.240 OPS in 44 plate appearances with runners in scoring position and two outs...began his season at Double A Corpus Christi...was promoted to Triple A Fresno on May 11, and was selected to the Major League roster on June 8...missed four games with left hamstring soreness from Aug. 26-30...made his Major League debut on June 8 at CWS, going 1x4 with an RBI-single oﬀ LHP Chris Sale...at 20 years, 259 days, became the youngest player in club history to make a start at shortstop, edging out Alex Taveras,who was 20 years and 341 days old on Sept. 14, 1976...became the youngest Astros position player to make his MLB debut since Derrel Thomas on Sept. 14, 1971 (20 years, 243 days)...became the third player in club history to reach base safely in each of his ﬁrst 10 Major League games, joining Kiké Hernandez (2014) and Jimmy Wynn (1963)...per Elias, became the third player in club history with three consecutive multi-hit games within the ﬁrst 10 days of his Major League debut: also Ken Caminiti (1987) and Orlando Miller (1994)...on June 18 at COL, stole three bases, becoming the third-youngest player in the modern era to swipe three bags in a game (20 years, 269 days) (Elias Sports Bureau)...Rickey Henderson (Aug. 23, 1979,20.241) and Ty Cobb (Sept. 2, 1907, 20.258) were the only two to do it at a younger age...was named the AL Rookie of the Month for June, becoming the sixth player in club history to win a Rookie of the Month award...led all AL rookies in OPS (.852), slugging (.543), RBI (15) and doubles (9) while ranking tied for ﬁrst in homers (5) and third in average (.287) during the month...in Houston's 12-8, 10th-inning victory over the Red Sox on July 3 at Fenway Park, hit a go-ahead solo homer in the 8th inning and a game-winning, RBI-single in the 10th...per Elias, became the ﬁrst player age 20 or younger to record a game-winning RBI in an extra-innings win since Manny Machado on May 10, 2013...the only other Houston player to do this was Cesar Cedeno in both 1970 and 1971 at the age of 19 and 20...tallied his 50th base hit on July 28 vs. LAA following a 3x4 performance...per Elias, became the fourth player since 1950 to accumulate 50 hits within his ﬁrst 42 games in the Majors before turning 21, joining Rennie Stennett (1971) and Hall of Famers Roberto Clemente (1955) and Orlando Cepeda (1958)...recorded his 15th homer on Aug. 19 vs. TB in what was his 62nd game...per Elias, there have been only two players in Major League history to hit at least 15 homers before turning 21 in fewer games than Correa did: Willie Mays (55th game, in 1951) and Frank Robinson (58th game, in 1956)...on Aug. 14 vs. DET, drew three walks...at 20 years, 326 days, became the youngest Houston player to record three walks in a game since Joe Morgan (20 years, 10 days) did so on Sept. 29, 1963 vs. NYM...knocked his ﬁrst-career walk-oﬀ hit on Aug. 19 vs. TB...was an RBI-single in the 13th inning...went 3x4 with a triple, homer, single, walk, stolen base, four RBI and four runs scored on Oct.2 at ARI...the only player younger than Correa (21 years, 10 days) to record a homer, triple, single and walk in a single game since 1914 was Ted Williams (twice in 1939)...his four RBI on Oct. 2 at ARI tied his career high (accomplished three times), while his four runs set a single-game career high...became the youngest player in club history to record four RBI and four runs in the same game, and the youngest Major Leaguer to do so since Miguel Cabrera on July 1, 2003...started at shortstop in all six of Houston's postseason games...made his ﬁrst career postseason appearance in the Wild Card Game at NYY...at 21 years, 14 days,became the youngest player in club history to appear in a playoﬀ game...previously Richard Hidalgo (22years, 94 days) in Game 1 of the 1997 NLDS at ATL...became the third-youngest player to start a playoﬀ game at shortstop in MLB history, behind Miguel Cabrera (2003 NLCS) and Travis Jackson (1924 World Series)...recorded his ﬁrst career postseason hit in Game 1 of the ALDS...at 21 years, 15 days old, became the youngest player in club history to record a hit in the playoﬀs...the record was previously held by Richard Hidalgo, who went 1x4 at 23 years, 98 days old in Game 4 of the 1998 NLDS at SD...went 4x4 with two homers, a double and four total RBI in Game 4 of the ALDS vs. KC...became the second player in Astros franchise history to hit multiple homers in a postseason game, joining Carlos Beltran (Game 5 of the 2004 NLDS at ATL)...became the second-youngest player in Major League history (21 years, 20 days) to hit multiple homers in a postseason game, behind only Andruw Jones (19 years, 180 days), who hit two homers in Game 1 of the 1996 World Series at NYY...per ESPN Stats & Info, his 11 total bases in Game 4 of the ALDS marked the most by a shortstop in a single postseason game in MLB history...Derek Jeter held the previous record with 10 total bases in Game 1 of the 2006 ALDS vs. DET...per the Elias Sports Bureau,became the youngest player to record at least four hits and four RBI in a postseason game...the only other player to do this before his 25th birthday was Goose Goslin (23), who did so in Game 4 of the 1924 World Series for the Senators...per Elias, became the third player in MLB history age 21 or younger to hit in the third spot in the order in a playoﬀ game, joining Joe DiMaggio (1936 World Series) and Mickey Mantle(1952 World Series). Began the season ranked by Baseball America as the No. 1 prospect, 'Best Defensive Inﬁelder', 'Best Inﬁeld Arm' and 'Best Hitter for Average' in Houston's system, as well as the No. 7 prospect overall in baseball...had a standout season at Class A Advanced Lancaster as a 19-year-old before sustaining a season-ending ankle injury (fractured right ﬁbula) in June...was named a California League Midseason All-Star, hitting .325 (81x249) with 16 doubles, six triples, six homers, 57 RBI, 20 steals and a .926 OPS (.416 OBP/.510SLG)...prior to his injury, was leading all California League shortstops with a .969 ﬁelding percentage...named an MiLB.com Organization All-Star...had just ﬁve plate appearances against younger pitchers, spending the vast majority of the season facing older competition (288 plate appearances)...named Lancaster's Player of the Month for May (.330, 38x115, 8 2B, 1 3B, 3 HR, 31 RBI, 9 SB)...received his ﬁrst career invite to Major League Spring Training on Jan. 14...played in 16 Major League games, hitting .200 (6x30) with two doubles,two homers and three RBI. Entered the season ranked by Baseball America as the No. 1 prospect, 'Best Power Hitter', 'Best Defensive Infielder' and 'Best Infield Arm' in the Astros system...tabbed by MLB.com as the No. 30 prospect overall and No. 5 shortstop prospect in baseball...ranked by ESPN.com as the No. 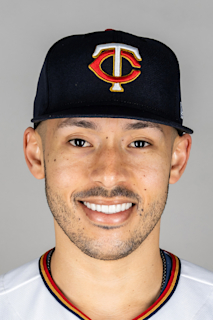 24 prospect in baseball...was in minor league camp, but joined the Astros Major League club for four games and hit .455 (5x11) with three RBI in those games...played the entire regular season with Class A Quad Cities, posting a .320 (144x450) average with 33 doubles, nine home runs, 86 RBI and a .405 on-base percentage...led all Midwest League shortstops in fielding percentage while playing the entire season as the second-youngest player in the league...offensively, he led the league in OPS (.872) while finishing second in on-base percentage (.405) and third in batting average (.320)...was named a Midseason and Postseason All-Star...earned Quad Cities Player of the Month in May (.349, 30x86, 6 2B, 18 RBI) and in June (.370, 37x100, 6 2B, 2HR, 15 RBI). Drafted first overall by the Astros out of the Puerto Rican Baseball Academy in Gurabo, P.R...the draft was held on June 5, and Correa signed two days later on June 7...reported to the GCL Astros, were he would make his professional debut on June 18 vs. the GCL Cardinals and went 1x5 with a walk and a stolen base...would go on to play 39 games, hitting .232 (36x155) with 11 doubles, two home runs and nine RBI...started 36 games at shortstop, committing 11 errors...hit .324 (11x34) vs. LHP...named the GCL Astros Defensive Player of the Month in July...promoted to rookie level Greeneville on Aug. 11 and hit .371 (13x35) with three doubles, one triple, one homer and three RBI in 11 games, all starts at shortstop...following the season, was named by Baseball America as the 'Best Power Hitter' among the Astros 2012 draft class and shared Best Defensive Player honors with OF Andrew Aplin...also rated by BA as the No. 2 prospect in the GCL, trailing only OF Byron Buxton. August 10, 2018 Houston Astros activated SS Carlos Correa from the 10-day injured list. August 2, 2018 Houston Astros sent SS Carlos Correa on a rehab assignment to Corpus Christi Hooks. June 29, 2018 Houston Astros placed SS Carlos Correa on the 10-day disabled list retroactive to June 26, 2018. Lower back soreness. September 3, 2017 Houston Astros activated SS Carlos Correa from the 10-day disabled list. August 31, 2017 Houston Astros sent SS Carlos Correa on a rehab assignment to Corpus Christi Hooks. August 24, 2017 Houston Astros sent SS Carlos Correa on a rehab assignment to Fresno Grizzlies. July 18, 2017 Houston Astros placed SS Carlos Correa on the 10-day disabled list. Torn ligament in left thumb. June 8, 2015 Houston Astros selected the contract of SS Carlos Correa from Fresno Grizzlies. May 12, 2015 SS Carlos Correa assigned to Fresno Grizzlies from Corpus Christi Hooks. April 1, 2015 SS Carlos Correa assigned to Corpus Christi Hooks from Lancaster JetHawks. January 13, 2015 Houston Astros invited non-roster SS Carlos Correa to spring training. October 30, 2014 SS Carlos Correa assigned to Indios de Mayaguez. October 30, 2014 Indios de Mayaguez placed SS Carlos Correa on the reserve list. September 17, 2014 Lancaster JetHawks activated SS Carlos Correa from the 7-day disabled list. June 23, 2014 Lancaster JetHawks placed SS Carlos Correa on the 7-day disabled list retroactive to June 22, 2014. April 2, 2014 SS Carlos Correa assigned to Lancaster JetHawks from Quad Cities River Bandits. January 14, 2014 Houston Astros invited non-roster SS Carlos Correa to spring training. May 10, 2013 Quad Cities River Bandits activated SS Carlos Correa from the 7-day disabled list. May 3, 2013 Quad Cities River Bandits placed SS Carlos Correa on the 7-day disabled list. April 1, 2013 SS Carlos Correa assigned to Quad Cities River Bandits from Greeneville Astros. March 16, 2013 SS Carlos Correa assigned to Houston Astros. November 5, 2012 SS Carlos Correa assigned to Gigantes de Carolina. November 5, 2012 Carlos Correa roster status changed by Gigantes de Carolina. August 11, 2012 Carlos Correa assigned to Greeneville Astros from GCL Astros. June 8, 2012 Carlos Correa assigned to GCL Astros. June 7, 2012 Houston Astros signed SS Carlos Correa.